Lined seahorses are unsuitable as pets if you have little time to devote to their habitat. They live as long as five years and require a lot of specialized care. These seahorses are often picked on by other fish, so it's ideal to build your tank around your lined seahorse to ensure every creature in the habitat remains healthy and happy. Learn to care for a lined seahorse before bringing one home, and consult your vet right away if you have questions or concerns. Home your lined seahorse in an aquarium of at least 30 gallons. Seahorses need ample space to swim, and they require multiple hiding spots to feel secure. Test the water in your tank frequently to make certain it is stable and safe for your seahorse. Keep specific gravity levels between 1.020 and 1.025, and ensure the pH remains between 8.1 and 8.4. Monitor the temperature in your tank, keeping it between 72 and 78 degrees F. This is the optimal environmental temperature for the lined seahorse in the wild. Provide plenty of vertical plants and other stationary perches for your seahorse to wrap his tail around, making sure the perches are not near filters or anything else that may draw the tail. Feed your pet a live and varied diet to maintain his health and energy. Brine shrimp, mosquito larvae and daphnia are good choices. It's best for your seahorse to eat many small meals each day instead of a few larger ones. 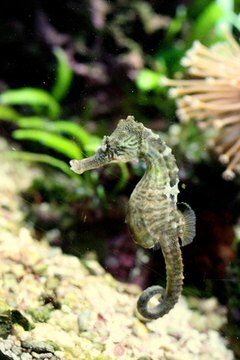 Feeding seahorses takes a lot of time and attention -- in the wild they consume as many as 3,000 brine shrimp every day. Choose tank mates carefully to protect your seahorse. Seahorses are slow and generally peaceful, making them targets for more aggressive fish. Choose less aggressive fish, such as Mandarins, to share water with your seahorse. University of Wisconsin: Is the Male Seahorse the Ultimate Mr. Mom?